This page is full of advice for international travelers. If you have an idea for something that should be included on this page, please email us at vacation@visitlex.com. Do you need a visa? Thirty-six countries participate in the Visa Waiver Program (VWP), but citizens of those countries must receive approval for travel via the Electronic System for Travel Authorization (ESTA) prior to travel to the United States. This link provides detailed information about ESTA. If you are a citizen of a country that does not participate in the Visa Waiver Program, you will need a visa. Click here for detailed information about obtaining a visa provided by the U.S. Department of State. Kentucky has mild weather, with four distinct seasons. Locals refer to September, October and November as Fall, when the leaves on many trees turn beautiful shades of orange, yellow and red. Winter (December, January and February) can be cold. The average winter temperature in Lexington is around 2 degrees Celsius. It does snow occasionally, but significant accumulation is rare. In the Spring (March, April and May) the fields turn green and trees begin to flower. In the summer, June and July can be hot, and August is typically hot and humid. 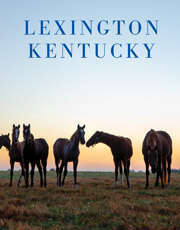 Here is a link to typical weather, month by month in Lexington, Kentucky. Because our weather is typically mild, there is really no season that you need to avoid. If you are coming to experience our famous scenic beauty, April through October would be the best time to come. Some tourist attractions have limited hours of operation in January and February. Statistically, October is the driest month. Lexington has its own beautiful, modern airport, Blue Grass Airport (LEX). 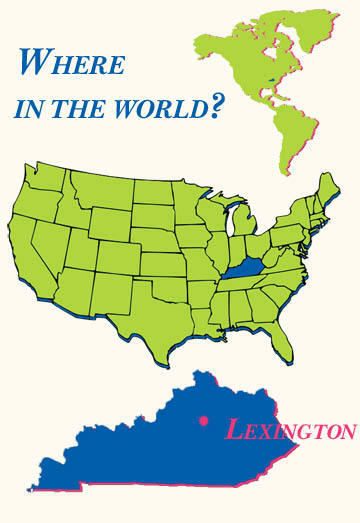 Larger airports in Hebron, Kentucky (CVG) and Louisville, Kentucky (SDF) receive direct flights from many international destinations that connect in to Lexington. In Kentucky, most locals and visitors go everywhere by car. There are no subways, street cars or rail transport. Efforts are underway to make streets and roads more bicycle-friendly. You may find that renting a car is your best option. The downtown area of Lexington is very "walkable" with hotels, shopping, dining and entertainment options all within easy walking distance. An international driver&apos;s license is not required; a valid license from your home country is sufficient. However, an international license may be helpful in case the car rental agent cannot recognize or understand your license from your home country. Some agencies will not rent cars to anyone less than 25 years old. Automatic transmissions are most common; rental cars with standard transmission are rare. Wearing your seat belt is required by law. If you are traveling with children, in Kentucky, children 40 inches (101.6 cm) or shorter are required by law to be in a child restraint/car safety seat; children ages 6 and younger who are between 40 and 50 inches tall must use a booster seat. In Lexington, you may turn right after stopping when the traffic light is red, unless there is a sign posted saying "no right turn on red." The roads in Lexington are busiest between 7:30 a.m. and 8:30 a.m. and between 4:30 p.m. and 6 p.m. Even though Lexington is a small town, we are served by several cab companies. Taxis will be lined up just outside the exit of the airport. There is also a taxi queue in the evenings in the center of downtown at the corner of Main and Upper Streets. However, it is not common to try and hail a cab while you are standing on the sidewalk. You can make your arrangements by calling one of the taxi companies. Both Uber and Lyft are active in Lexington. At Lexington restaurants, plan to tip your server 15% to 18% of your total bill. (We do not tip the staff at fast food restaurants where you stand at a counter to order.) If you are dining with a group of six or more people, look at your bill closely. Some restaurants will automatically add an 18% gratuity to your bill without asking when dining as part of a group, so review your bill carefully. If you are staying in a hotel, many people leave a tip for the housekeeping staff of one or two dollars each day. If someone carries a piece of luggage for you, $1 per bag tip is common and will be appreciated. The minimum drinking age in the state of Kentucky is 21. Don&apos;t be surprised if you are asked to show proof of your age. Bars and restaurants may serve alcohol until 2:30 a.m. Liquor stores, also known as "package" stores, may sell liquor between 7 a.m. and 2:30 a.m. (only till 9 p.m. on Sundays). Smoking is not permitted in restaurants, bars or any public buildings. Many restaurants allow smoking on their patio or sidewalk dining areas. In the U.S. each state may have its own tax laws. Kentucky&apos;s sales and use tax rate is 6 percent. Kentucky does not have additional sales taxes imposed by a city or county/district. You will see sales tax on your receipts when shopping retail, purchasing communication services and on your hotel bill. Most food items that you purchase at a grocery store or market will not be taxed, but restaurant food and alcoholic beverages will be taxed. All hotels will have internet access. Internet cafes are not common in the United States and you are not likely to find one in Lexington. However, some restaurants and coffee shops (including all Starbucks coffee shops) have free wireless internet, as does our airport. All branches of the Public Library have internet connectivity, and also have computers that you may use. You will need to show your passport or driver&apos;s license and get a guest pass to use library computers, but it is free. Depending on the type of cell phone you own, and your service plan, you may find it convenient to purchase a prepaid cell phone here for communicating within the U.S. It is easily done at local phone stores (Sprint, AT&T, Verizon, T-Mobile) or even big discount stores like WalMart or Best Buy. Locals express time using a.m. and p.m. and do not use "military" time. 12:00 "military time" is expressed as "noon" or 12 p.m. and 24:00 is expressed as "midnight" or 12 a.m. Start times for meetings, performances, parties, interviews, etc. are not considered flexible. If you are going to be late for an appointment, you should call ahead if possible. Most people who are employed take their lunch between noon and 1 p.m.